John T. Echols – A murderer and horse thief, Echols shot John Pattenridge in a quarrel over a cattle deal in the Chickasaw Nation of Indian Territory. After he stole the dead man’s horse, he was captured and convicted of murder. He was hanged at Fort Smith, Arkansas on January 14, 1887. Juan Elvard – A New Mexico outlaw, Elvard was lynched in August, 1882 in Socorro. Joseph M. Edwards – A New Mexico outlaw, Edwards was killed by Sheriff Thomas L. McKinney in Rattlesnake Springs, New Mexico on May 8, 1881. Frank “Peg-Leg” Elliott – An outlaw and part-time member of the Dalton Gang, he was arrested and charged with robbery on October 27 1891. Charles Ellis – A Texas outlaw charged with train robbery and murder in 1898. Elmoreau, aka: Frenchy – Outlaw member of Ike Stockton’s gang, he was lynched in October, 1881 in Socorro, New Mexico. “El Pollo” – A horse thief that was was captured near Socorro, New Mexico and shot by a lynch mob on February 8, 1869. Clarence Eno – Outlaw member of the Cookson Hills Gang, he participated in numerous bank robberies in Oklahoma, Kansas, and Nebraska. Rafael Escobar – An outlaw who was lynched by a vigilance committee at Jackson, California, in the 1850s. Dyson Eskridge – An outlaw and murderer, he was a member of Ike Stockton’s gang. Harg Eskridge – An outlaw rustler and brother of Dyson, he was a member of Ike Stockton’s gang. Felipe Espinosa (1836? -1863) – Leader of the “Bloody Espinosas,” who robbed and killed in the 1850s-60s in New Mexico and Colorado. He and his cousin, Julian, were finally killed by mountain man, Tom Tobin in 1863. Julian Espinosa (18?? -1863) – The oldest of the outlaw “Bloody Espinosas,” who robbed and killed in the 1850s-60s in New Mexico and Colorado. He was finally killed by mountain man, Tom Tobin in 1863. Vivian Espinosa – The youngest of the outlaw”Bloody Espinosas” he was killed by posseman Joe Lamb near Cripple Creek, Colorado in 1863. Selzo Espinoso – A New Mexico outlaw, was lynched on October 6, 1881 in Las Lunas. Tom Evan – An Oklahoma outlaw, Evan robbed a bank with three others in Limestone, Indian Territory, on January 23, 1888, and was killed. Christopher Evans, aka: Bill Powers (1847-1917) – Born in Vermont in 1847, Evans moved to Canada as a child but moved back to the states in time to serve in the Union Army during the Civil War. 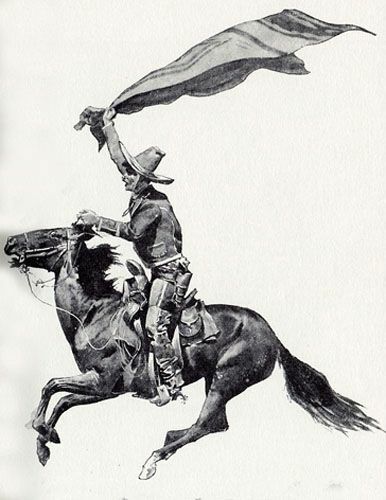 After the war, he served as a scout for the U.S. Cavalry. Later he moved to California with his brother Tom and after working as a prospector for a time, bought some land in Tulare County. Evans soon discovered his neighbors, George and John Sontag and when they turned to bank and train robberies, Chris joined them. In January, 1892, a posse tracked the trio down in a San Joaquin Valley barn. Following the inevitable gunfight, George Sontag was captured but Evans and John Sontag were able to get away. Law officers continued to pursue Evans and Sontag, finally catching up with them on September 13, 1893 at Sampson’s Flat, California. Another gun battle took place, lasting some eight hours. When the dust had settled, John Sontag was dead, as well as two deputies. Evans was wounded several times and was dragged unconscious to jail. On December 13th, he was convicted of murder and robbery but was able to escape with another prisoner. Both were later recaptured. Evans was sent to Folsom Prison in February, 1894. After fifteen years, he was released in May, 1911 at the age of 64. He then moved to Oregon where he homesteaded until his death on February 9, 1917. Daniel Evans – An Oklahoma outlaw, Daniel, along with William Whittington, robbed and killed their traveling companion, 19 year-old William Seabolt in the Creek Nation of Indian Territory. They were both hanged at Fort Smith, Arkansas on September 3, 1875.